The lamb used for this recipe was provided by The Whole Ox, a full-service butcher in Marshall, Virginia. I love buying meat here, because it comes with the assurance that it was ethically farmed and humanely raised. 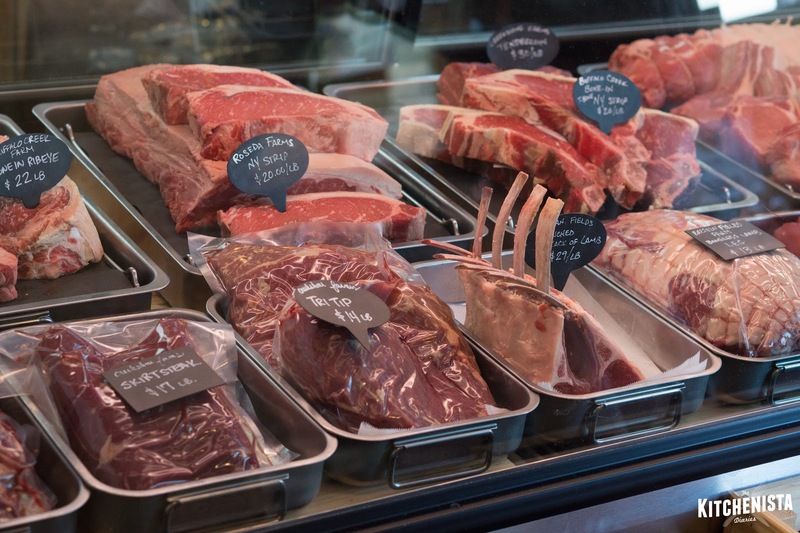 If you've never been to an old-fashioned butcher shop, The Whole Ox is worth a day trip. Amanda, Derek and Andrew are always helpful and willing to teach you just about anything you wanted to know! Rack of lamb intimidated the hell out of me as a young home cook, even more so than steak. It was one of the most expensive things I'd see at the meat counter and the last thing I wanted to do was mess up and waste money. Nearly every recipe I came across called for roasting the rack of lamb in the oven, often at a high temperature, sometimes searing in the beginning to crisp the surface. Sounds easy enough, but in practice, it's really easy to overcook the meat or cook it unevenly. 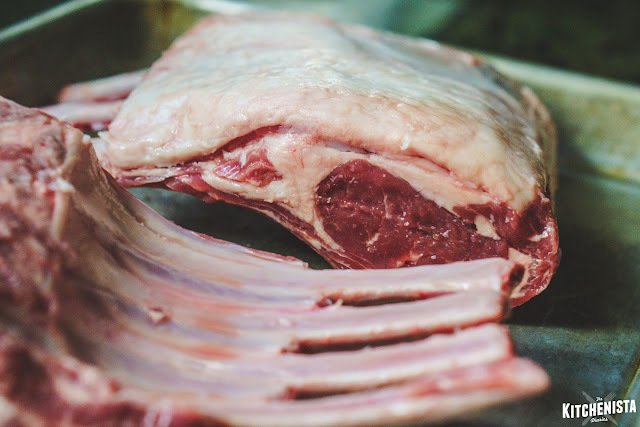 It wasn't until I got comfortable with cooking steaks using the reverse sear method that I felt like I knew what I was doing with a whole rack of lamb, which is also at its best cooked to a rosy medium rare. Letting the lamb come to temperature slowly in the oven first, and then searing makes it much easier to control the process. The probe thermometer is one of my favorite tools, making it possible to monitor the internal temperature of meat without opening the oven constantly. 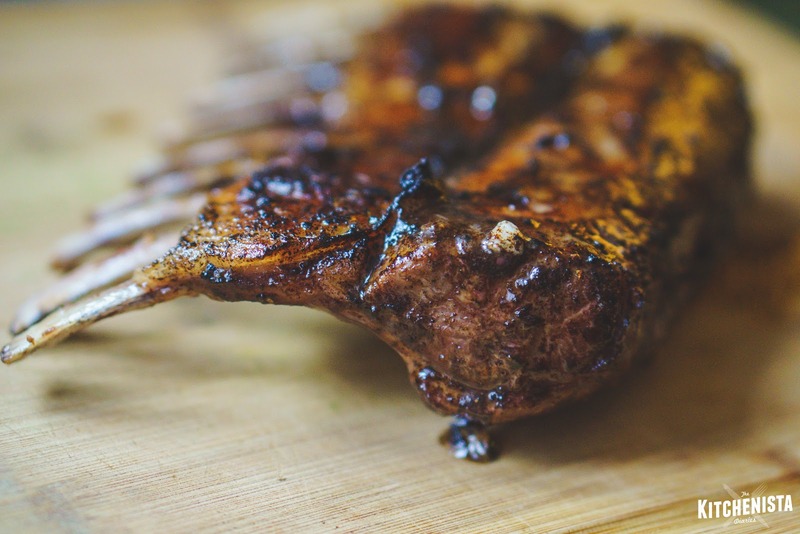 The reverse sear method isn't fool proof though, especially for smaller racks of lamb. Enter sous vide cooking, which alleviated all of my expensive meat anxiety. Similar to reverse searing, the meat is cooked slowly in a temperature controlled water bath first, and then seared at the end. Because the water temperature is set for the exact temperature you want the meat to be, it will never overcook. You still have to be cautious during the last step, but the fatty surface of the rack of lamb gives a little bit of protection. 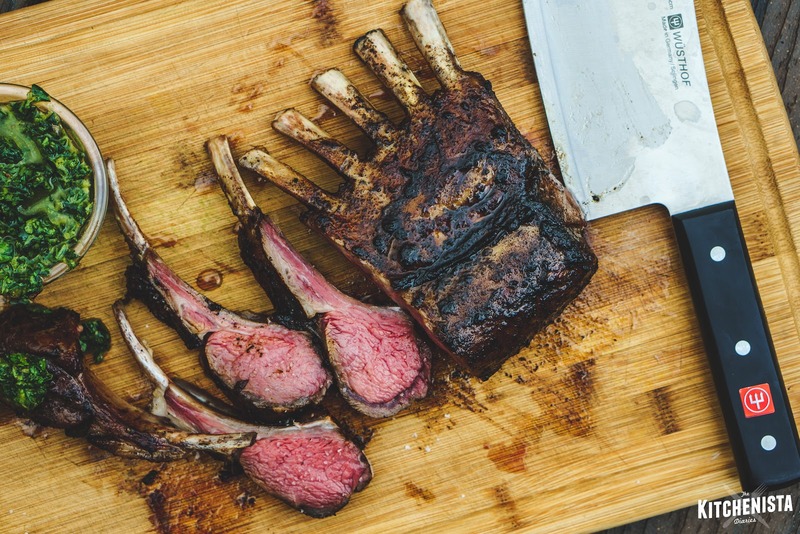 The best advantage of using sous vide cooking is that every section of meat is cooked to the exact same temperature, which is typically pretty hard to do for irregular shaped cuts like rack of lamb. I think it's also better for slowly rendering the fat in the lamb and tenderizing the meat, so the texture of sous vide lamb is that much more delectable. While rack of lamb can be cooked similarly to a nice steak, the meat can stand up to bolder seasonings, so think beyond salt and pepper. Instead of a traditional garlic and herb profile, I went with black garlic! In my last post, I wrote all about this trendy specialty ingredient, which is sweet, sticky and tangy. It's easy to mash up for a flavorful compound butter, which is a great way to finish off that perfectly cooked rack of lamb. Read on for the recipe below, which includes instructions for all three cooking methods. *Frenching the bones is optional, and may have already been done for you when purchasing. 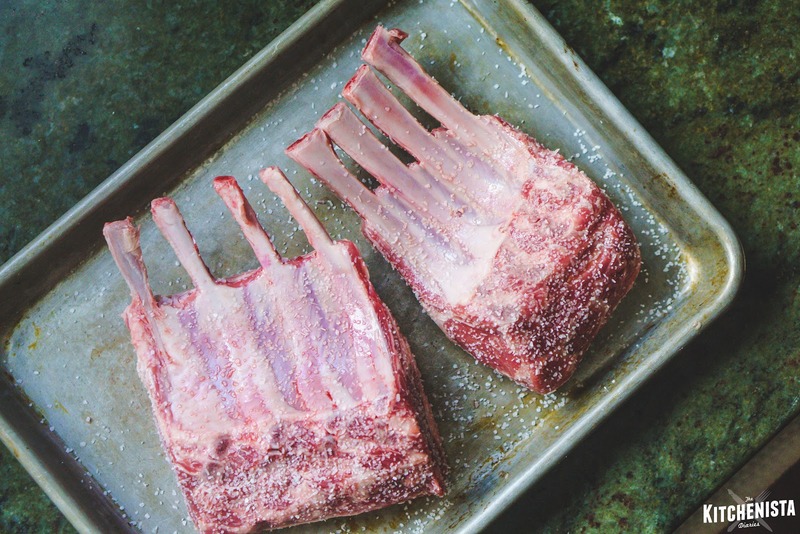 Stripping the meat from the ends of the bones is mostly for presentation, so if that's not important you may want to skip that step and enjoy the crispy bits of lamb rib meat. Special Equipment: For either of the oven methods, you'll need a probe thermometer , heavy duty sheet pan and oven-safe cooking rack . For the reverse sear method, you'll need a large cast iron skillet or other heavy bottomed pan. For the sous vide method, you'll also need a sous vide circulator and pot or other water container. To prep the black garlic butter, peel the bulb and use a spoon or flat spatula to mash up the sticky black cloves. 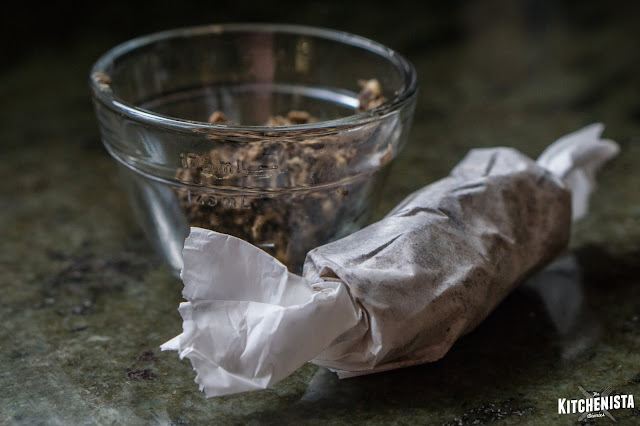 For easiest clean up, do this on a sheet of wax paper or parchment. Once you've worked the cloves into a paste you can incorporate the butter. Add a small pinch of salt and a generous pinch of black pepper. You could definitely do this in a food processor, but unless you're doing a couple sticks of butter at a time it's probably not worth the extra dishes. Keep mashing until the black garlic and butter are incorporated pretty evenly, but before the butter starts to melt too much. Scoop 4 tablespoons into a small bowl, which will be for the lamb. The rest can be rolled into a log and refrigerated or frozen for future use! 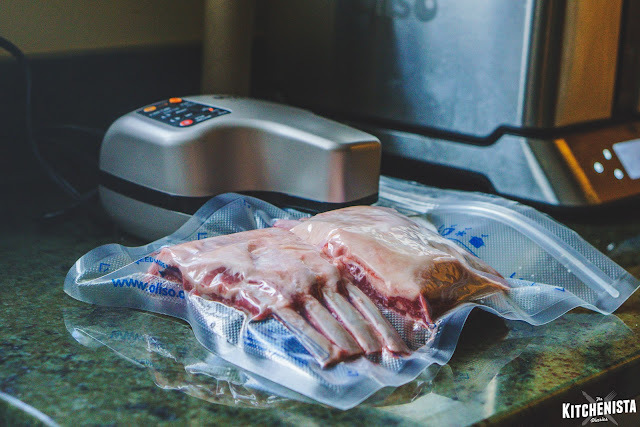 Prepare a sous vide water bath, setting the temperature on your circulator to 130°F. Place the salted rack of lamb (cut in half if necessary) into a plastic freezer-safe bag or vacuum bag. Use your vacuum sealer or the water displacement method to expel excess air from the bag. When the water reaches 130°F, submerge the bag of lamb and cook for 2 hours, or up to 4 hours. After the lamb cooks, remove it from the bag and pat dry. Smear it all over with black garlic butter. Heat your skillet over medium high heat, just shy of smoking. Place the rack fat cap side down into the hot skillet and sear for about 90 seconds, then flip to the other side. As the butter melts and lamb fat renders, tilt the skillet to one side and use a spoon to baste the top of the rack with all that goodness. Don't overcook it at this step; it should only be in the skillet for a couple minutes total. 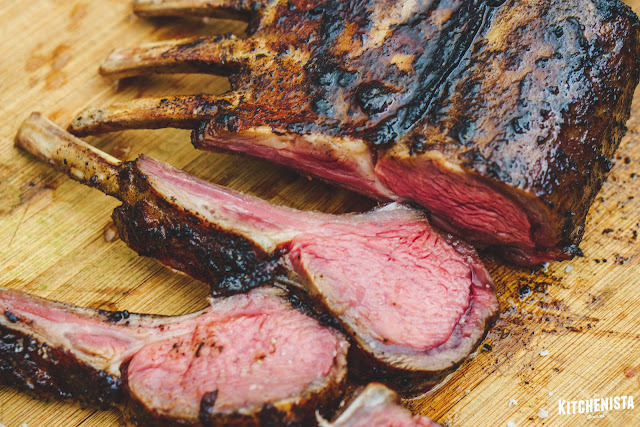 Transfer the finished rack of lamb to a cutting board. Slice and serve immediately, no need to rest. Drizzle with extra butter from the skillet. Preheat your oven to 500°F. Smear the salted rack of lamb on all sides with the black garlic butter. Place the racks with the fat cap side up on top of a metal cooking rack fitted inside a heavy duty sheet pan. Stick a probe thermometer in the center of the lamb chop, where the meat is thickest. Transfer the pan to the oven and roast until the meat reaches about 120°F. Pull the lamb out and transfer it to a cutting board, leaving the probe thermometer in. 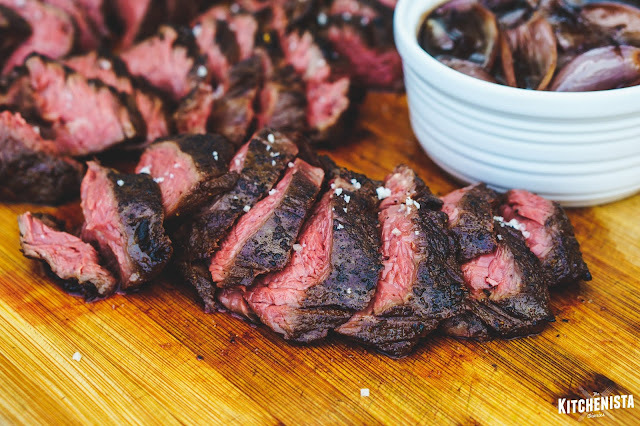 Allow the meat to rest for 5 to 10 minutes before serving, during which time the meat will continue to cook. My goal was to finish at around 130-135°F for medium rare. 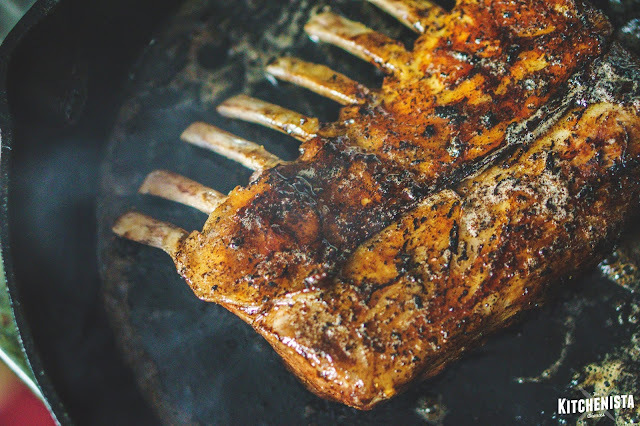 If you prefer your lamb cooked more than that, you can let it roast longer before resting. This method is nice if you have multiple racks to cook at once and don't want to deal with the extra step to sear them all. The downside is that you may not end up with a crusty outer surface for smaller racks. The meat can go from rare to overcooked in almost no time, so the probe thermometer is essential. Timing will vary from rack to rack. It could finish in as little as 10 minutes or up to 20 minutes for bigger racks. Preheat your oven to 250°F. 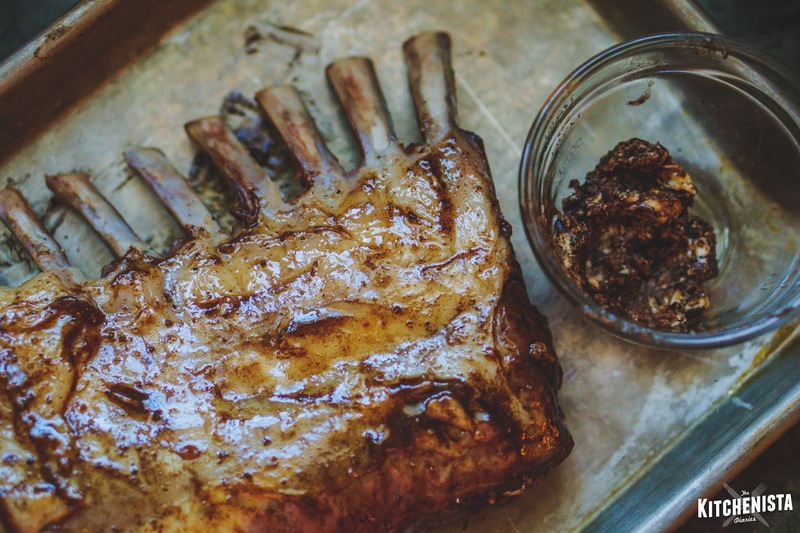 Smear the salted rack of lamb on all sides with half of the black garlic butter, about 2 tablespoons. 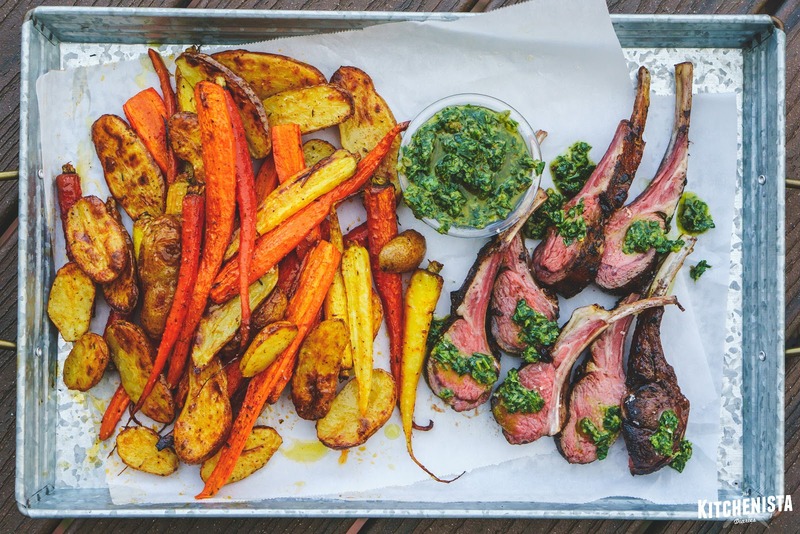 Place the racks with the fat cap side up on top of a metal cooking rack fitted inside a heavy duty sheet pan. Stick a probe thermometer in the center of the lamb chop, where the meat is thickest. Transfer the pan to the oven and roast until the meat reaches about 115°F, which could take up to an hour depending on the size of the rack. Take the pan out of the oven, transfer the rack of lamb to a cutting board and allow the meat to rest for 10 minutes. If it's not too difficult to maneuver, just leave the probe thermometer in for the next step, otherwise you might want to switch to a handheld instant read thermometer. Heat your skillet over medium high heat, just shy of smoking. Smear the rack of lamb with the remaining 2 tablespoons of butter. Place the rack fat cap side down into the hot skillet and sear for about 90 seconds, then flip to the other side. As the butter melts and lamb fat renders, tilt the skillet to one side and use a spoon to baste the top of the rack. Keep an eye on the temperature, and remove the lamb as it's approaching 130°F for medium rare. There's not much need to rest again, so by the time you transfer it back to a cutting board and slice you'll be in good shape to serve. Special occasion or holiday dinner? 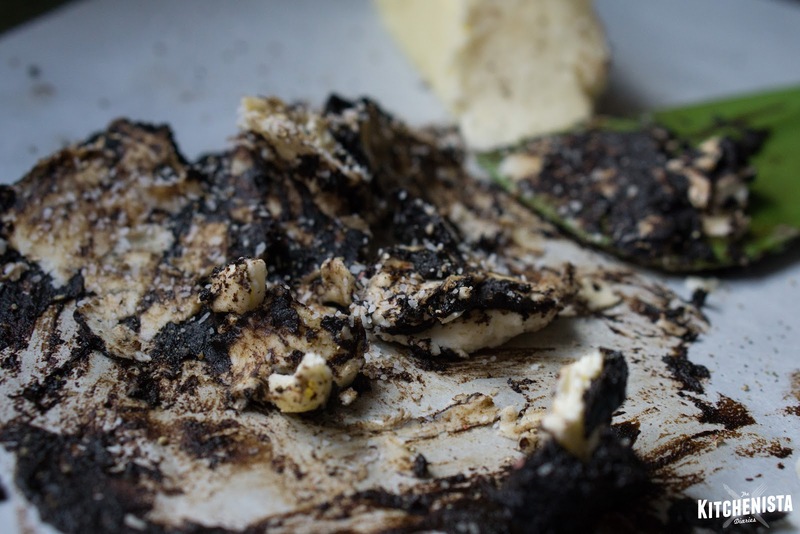 The black garlic butter is so good on its own, you would be fine plopping a couple chops on top of mashed potatoes or a nice rice pilaf, with green veggies on the side. 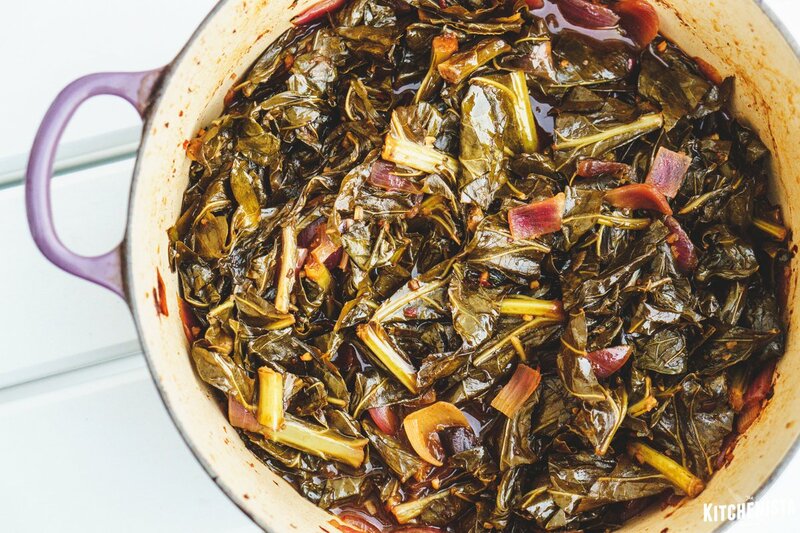 I'd suggest balsamic roasted asparagus (skip the truffle salt), or garlicky roasted greens. 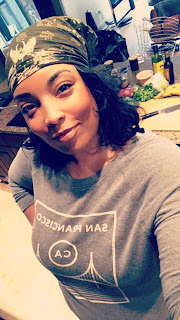 For the mashed potatoes and other veggie side options, check out my Holiday Recipe Collection. Casual dinner, small plates or appetizers? Consider pairing the sliced lamb chops with a bright herb sauce. 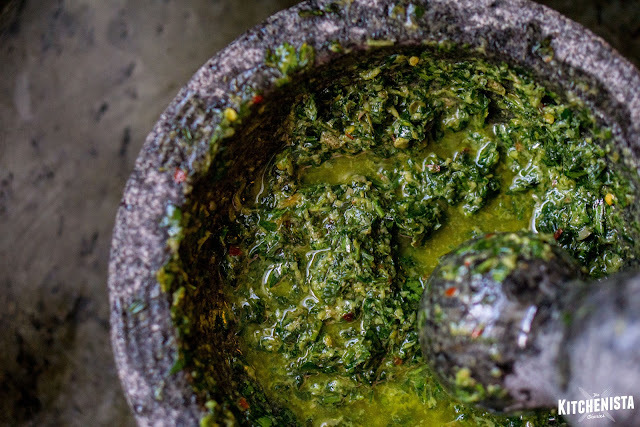 I love the classic pairing of mint and lamb, so I made the salsa verde recipe from my Appetizers Handbook and incorporated lots of fresh mint and lemon zest. The texture is very similar to chimichurri sauce, which would also work with a number of herbs. For a veggie component, I did a simple pan of roasted root veggies. They were tossed with grape seed oil and my Moroccan Rub, which is also in the Appetizers Handbook. 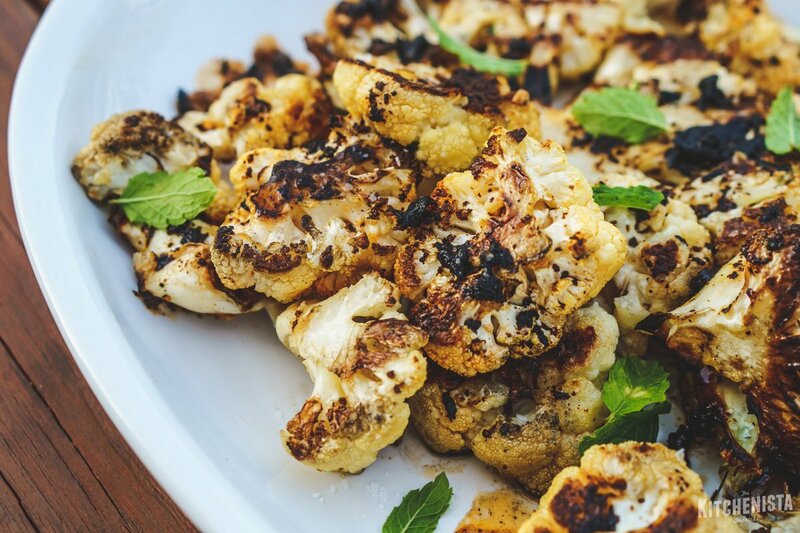 Check the Roasted Veggie Platter recipe in that book for tips on roasting the veggies too! Black garlic has been around for awhile, but lately it's popping up on menus and at high-end grocers at a pace that reminds me of the way truffles exploded onto the mainstream culinary scene a few years ago. 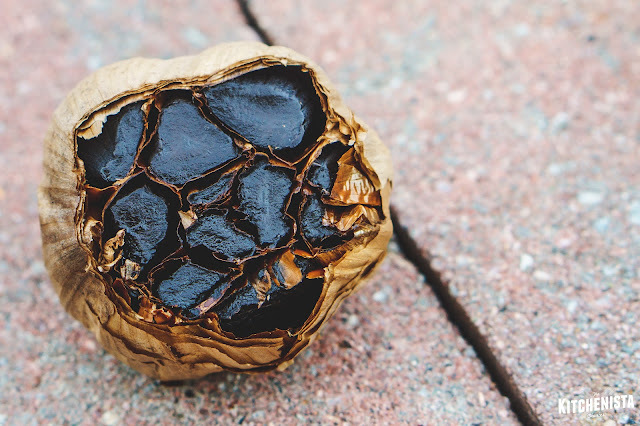 If you're a specialty foods chaser, black garlic should be on your list. It's simply garlic that has undergone a long and slow fermentation process under low heat, which transforms it into a darker, sweeter, more intensely flavored version of itself. 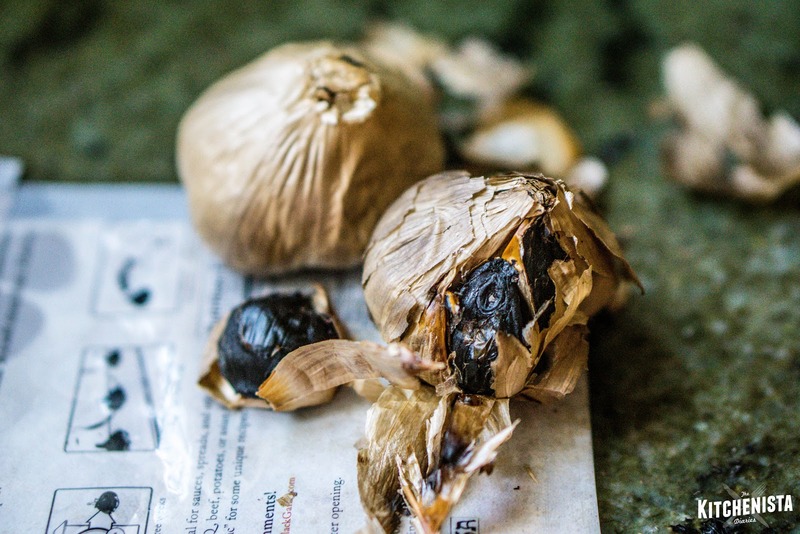 The origins of black garlic are hard to verify. It's often attributed to an ancient Korean method for preserving garlic, which was adapted stolen by a British farmer and commercialized. 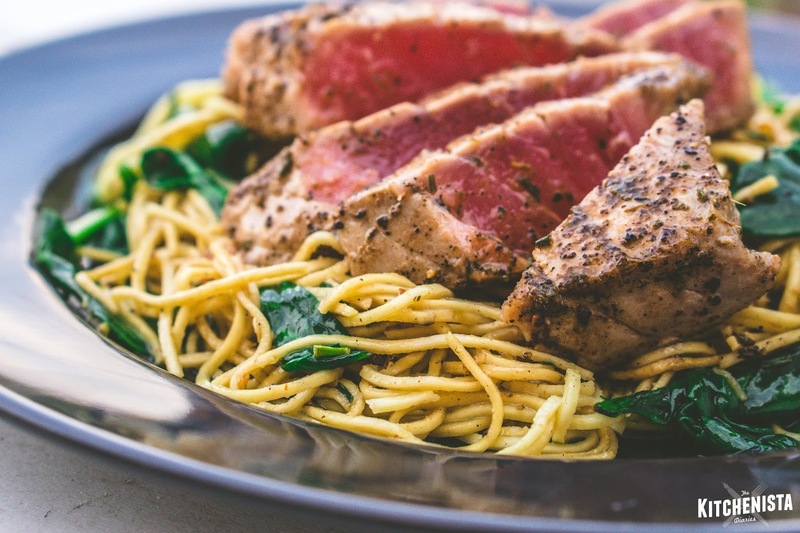 Some consider it a superfood, but again, details are sketchy on that too. 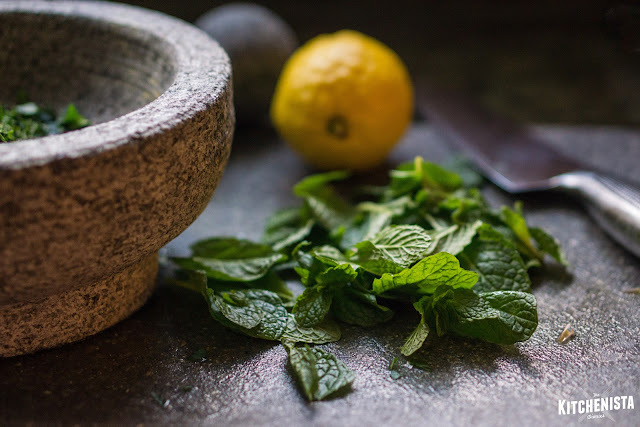 What I do know is that tastes wonderful and it's a fun ingredient to spruce up your usual dishes. Candied garlic probably doesn't sound nearly as appetizing, but that's what came to mind the first time I tried black garlic. The flavor reminds me of roasted garlic, balsamic vinegar and molasses rolled into one. It's savory and slightly tangy but the sweetness comes through most. Unlike truffles, black garlic is much less expensive and easier to find. I've spotted it at Wegmans, Trader Joe's, Whole Foods, gourmet markets, and online via Amazon (affiliate link.) Expect to pay around $25/pound for peeled black garlic gloves, but it's cheaper if you buy whole bulbs. Most of the packages will only come with a bulb or two anyway, as you certainly don't need to work with a whole pound at once. Just keep that in mind, because there's no reason to settle for what will inevitably become a surplus of imitation (or heavily processed) black garlic flavored foods flooding the market. I've already seen a major spice company release a dried black garlic salt! Black garlic looks a little scary, in an intriguing sort of way, and its sticky texture can be awkward to work with at first. (So sticky, that the extra cost for the convenience of peeled cloves is not such a bad thing!) Once you've got the papery peel off, the cloves can be eaten raw or cooked in recipes. They're soft, so while you could chop or slice the cloves, the easiest way I've found to use them is mashed or pureed with other ingredients. It's not a substitute for using fresh garlic in the base of most recipes, especially slow-cooked stews and braises. But it's an awesome finishing touch and adds complexity and depth to dishes in a similar way that roasted garlic does. It's excellent in stir fries, pasta sauces, salad dressing, aioli and my favorite, compound butter. 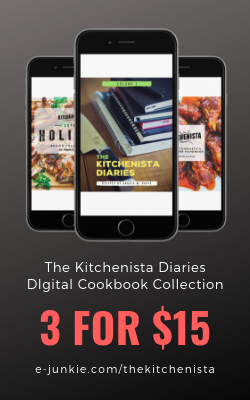 Check out a few of my dishes below for inspiration, or read on to the next post to learn how to make lamb chops even more delicious with black garlic!